Open 7 days a week 9am to 7pm. 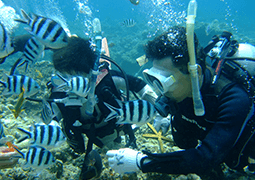 Kerama Islands full day tour- diving and snorkeling. 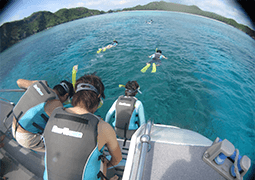 HOME ＞ Kerama Islands full day tour- diving and snorkeling. From morning to evening, you can spend the day relaxing in Kerama’s paradise. 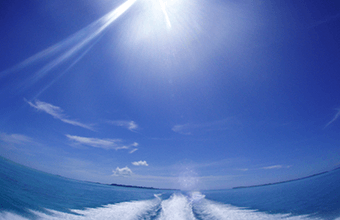 You can enjoy the beautiful sky, ocean and white sands from our boat. It will feel as you are in a resort. In Kerama’s beautiful transparent waters you can see straight down to the oceans floor where a mix of colourful playful fish and of course sea turtles await you. 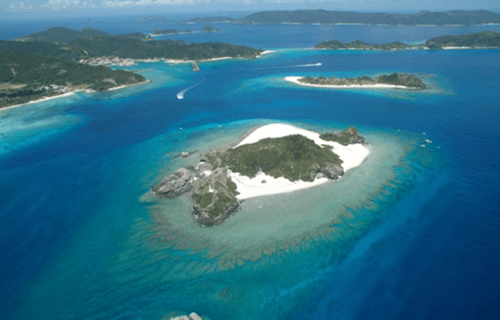 Our tours will take you to Zamami island, Kuro Island, Tokashiki island and Gishippu Islands in Kerama. 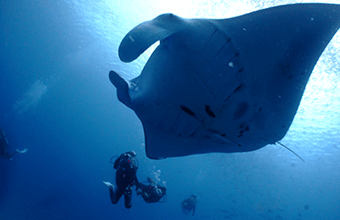 Once spending an unforgettable morning diving, you can enjoy lunch on our boat. From the afternoon, we will change our diving location where you can snorkel for free or as an option take another amazing dive. An added dive will cost 5400 yen. Below the bright and shining sun take time to relax and refresh yourself in paradise. For those who wish to capture their memory in paradise don't worry. We have underwater cameras available for purchase on our cruisers. ※People over the age of 60 are unable to dive. 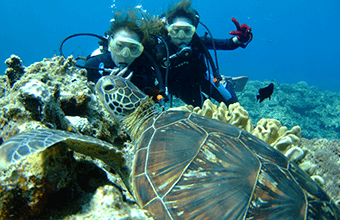 ■We also have a perfect deal 2 dive plan. ・Rental fee for equipment and lunch. Naha city Miegusuku port’s waiting place. After meeting at the meeting point at Miegusuku port we will depart towards the Kerama Islands. We will arrive at our first diving point in Kerama. The first diving experience will begin. Once we finish we will depart for our second diving point. We will arrive at our second diving point in Kerama. Here you can snorkel or request a second dive. We will have lunch and a small break. 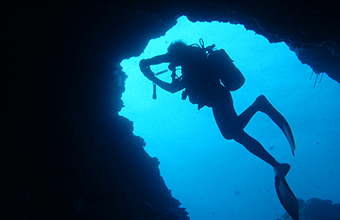 Here you can snorkel or request another dive. We will depart for Naha. After returning to Naha you are free to leave. Thank you very much for joining us today. ・We can take reservations between 9am to 7pm the day before you wish to join a tour with us. 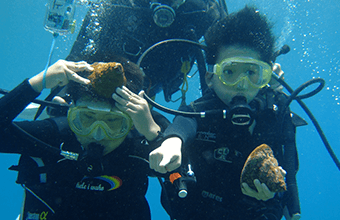 ・Children over the age of 8 can dive with us. ・Participants who have Cardiovascular and respiratory diseases, hypertension, otitis media, epilepsy, diabetes, liver disorders, who are pregnant or have hangovers or have consumed alcohol the day of the tour are unable to join our tours. Please be aware of this. ・Due to atmospheric pressure, you cannot fly the same day that you have dived. ・A consent form must be signed for minors. 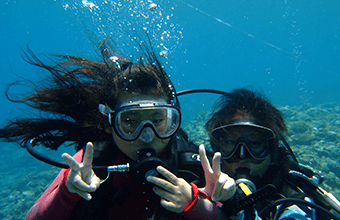 ・For safety reasons, due to bad weather or bad sea conditions there is a possibility we cannot go to every dive point. Therefore, there may be a change in schedule or the tour may be cancelled. Reservations can be made any time online. about our tours or any other related questions please contact us. Children from the age of 8 can join. 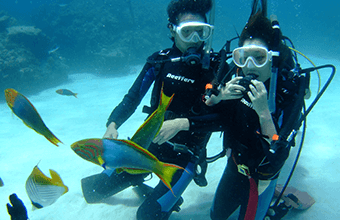 Enjoy diving together as a family! We will arrive at our first diving spot in Kerama. 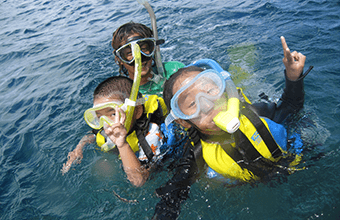 Enjoy snorkelling individually or with an instructor. After we finish we will move to our next diving point. We will arrive at our second diving point in Kerama. 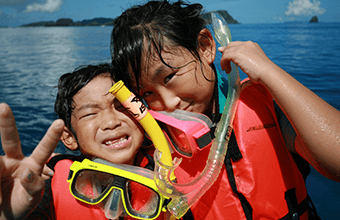 Enjoy snorkelling individually or with an instructor. We will have lunch and a short break here. 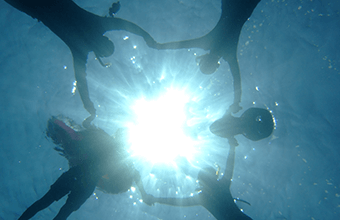 Enjoy snorkelling individually or with an instructor. We will return to Naha. Once we arrive at the port you are free to leave. ・Reservations can be made during our opening hours 9am to 7pm the day before your desired tour. ・We do not land on the islands of Kerama. ・Snorkelling is generally done by oneself. There are times when we will have an instructor in the water with you. 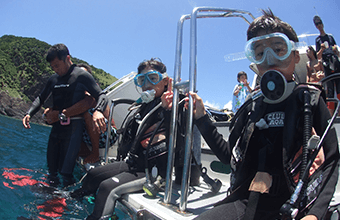 ・For safety reasons, due to bad weather or bad sea conditions there is a chance that we won’t be able to visit all three diving sites. There is a chance that the tour will be cancelled. ・We have masks with special lenses for guests who wear glasses. ※People over the age of 60 are unable to join the tour. 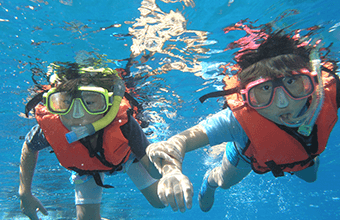 ※For Infants (until the age of 2) Snorkelling sets and lunch are not included. Please click here to see children’s snorkelling. We will arrive at our first diving spot in Kerama. 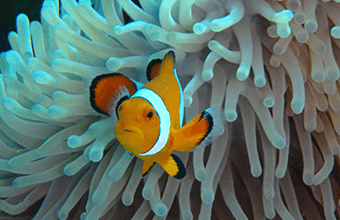 You are free to enjoy snorkelling by yourself. Once we finish we will move to our next diving spot. We will arrive our second diving point in Kerama. You are free to enjoy snorkelling. Once you finish we will lunch and a short break. You are free to enjoy snorkelling. We will return to Naha. Once we return to the port you are free to leave. Thank you for joining us. 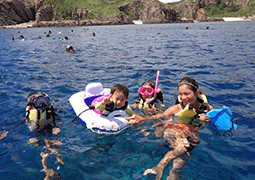 ・Snorkelling is generally done by oneself. There are times we will have an instructor in the water with you. ・For safety management reasons, we ask you wear a wetsuit or life jacket at all times when in the water. ・We kindly ask that you refrain from skin diving or swimming down under the water. ・In the case of bad weather or bad sea conditions there is a chance that we won’t be able to visit all three diving sites. There is a chance that the tour will be cancelled. ・We have masks with special lenses for customers who wear glasses. 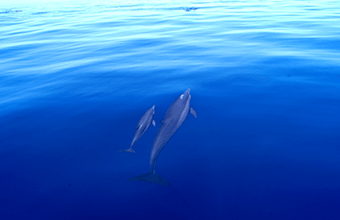 ・We have both diving and snorkelling tours operating on the same boat. We ask that you please take care to avoid injuries. 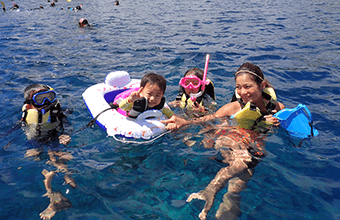 Give your children the present of a great memory snorkelling in Kerama. 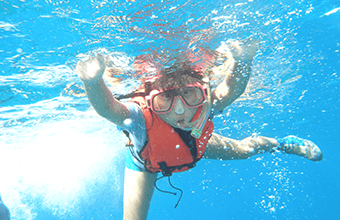 ＊For Infants (up to 2 years old) snorkelling sets and lunch are not included. ・Reservations can be made during our operating hours 9am to 7pm the day before your desired tour. 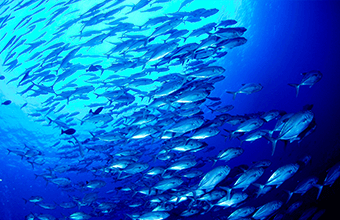 ・Fee for 2 dives, Lunch and insurance. We will arrive at our first diving point in Kerama. Here you will have your first dive. After we finish we will move to our next diving point. We will arrive at our second diving point in Kerama. Here you will have your second diving experience. After we finish we have lunch a break. 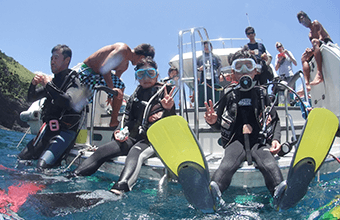 Here you can enjoy snorkelling or request another dive at an extra cost. ・You can make a reservation during our operating hours. ・It will be a C card holder’s tour. Please bring your card and log book with you. 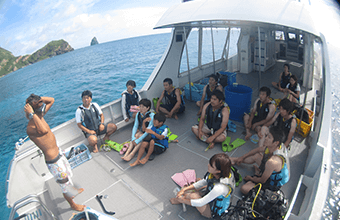 ・Customers who have health concerns like Cardiovascular system, respiratory disease, High blood pressure, ear infections, pregnancy, epilepsy, diabetes, liver problems or customers who are hungover or have consumed alcohol the day of diving will not be able to join our tour. Please take note of this. ・Due to problems with atmospheric pressure you are not allowed to fly the same day that you have dived. ・A consent form must be signed by caregivers for minors. ・In the case of bad weather or bad sea conditions there is a chance that we won’t be able to visit all three diving points. There is also a chance that the tour could be cancelled. 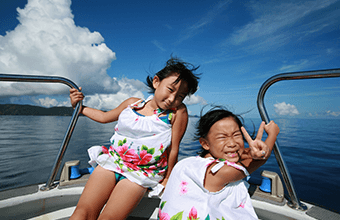 From morning to evening, you can spend a full day enjoying the beautiful ocean and surroundings of the Kerama islands. You can enjoy the same relaxing vibes as staying in a resort. 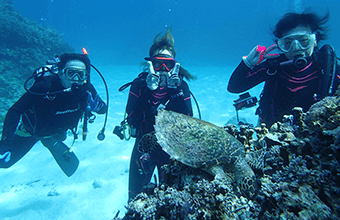 You can enjoy snorkelling and relaxing in the waters off the deserted Kerama Islands. 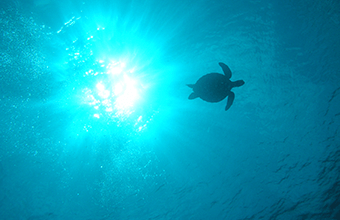 Meet cute sea turtles and various rare sea animals that live in the waters of Kerama. Even when joining a half day tour with Reeffers, you can experience the full beauty of Kerama and its surroundings. 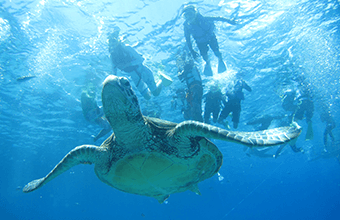 As a bonus, you can also enjoy snorkelling and request a second dive. 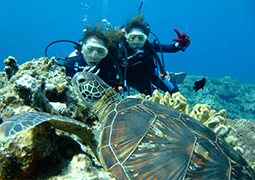 You can enjoy the beautiful ocean of the Kerama Islands with this Half day tour. 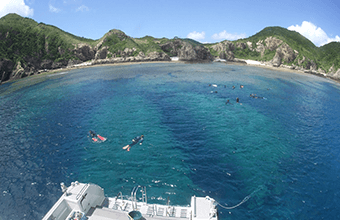 If you want to enjoy shopping, sightseeing and snorkelling in Okinawa, this is the plan for you!